Today I’m feeling really excited because I’m going to post a picture that I love. It’s a photo I made during summer vacation. In summer I usually travel somewhere with friends, and later I spend some time in Galicia with all my family. When I say all my family I do not only mean my parents and my sister. I mean all my uncles, grandparents, cousins, my cousin’s sons, my second cousins, my mother’s cousins, my third cousins, and many more people that I don’t even know how to name the way in which we are related. It’s really funny because we are a lot and of every ages, from a little baby of only some months to my grandparents. Ok, so I was happily having vacation, when I felt the need of taking a picture and I started to think some ideas. Usually I start thinking about near locations or props I can obtain. There I have the ocean, forests, dunes, waves, and an underwater case….I’ve got some good ideas and I even started to prepare a semi-underwater session, but I wanted a weird model and it wasn’t easy job to find her there. Then I decided to keep on thinking new ideas, more focused on the models I could easily get in Galicia. I saw my little cousins running, trying to chase my poor dog in the garden, and I saw it clear: “Peter Pan’s Lost Boys”. 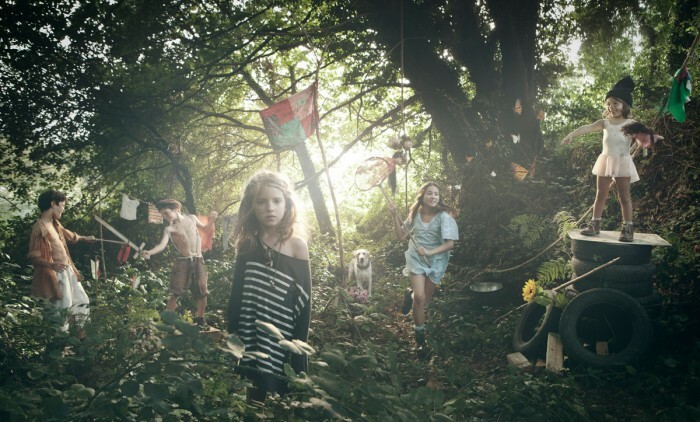 I could take some of my little cousins and set up a camp of lost boys somewhere in a near forest. It was amazing, at the following day she had everything I’ve asked for. Except for the monkeys…she must have forgotten…but I have to confess that they wasn’t really needed, it was only a whim of mine. With a few tires I got from my grandfather’s garage and a flag I did with some patches that my aunt Encarna gave me, I had everything I could need. I set up the camp with my father in the morning and in the afternoon we took the picture. It was great, but I had some problems with the sun, because it came out only a few minutes. But I took advantage of that little time to make a clean background picture. Then I made a shot of each children separately with the sky a bit cloudy and I simulated the previous lighting of the background with a flash. I think it worked out pretty well. Here you have the picture and a behind the scenes video. I want to thank all my family for their help and support, it was great. My cousin Ali did the styling and make up, and my sister Cris recorded the behind the scenes footage . I’m thinking about doing some portraits of these, lets see how it goes.